Among the many delights of a trip to Egypt are visits to its many well-preserved temples, including the one in Luxor typically seen at night. But no matter how well preserved the temples, are all missing at least one of the matched pair of obelisks, some more than 100 feet tall, which once flanked their entrances. The missing obelisks were not lost – they are in Europe, some standing in front of famous churches. And while the obelisks are missing from Egypt, their spiritual descendants are in front of places of worship around the world. For ancient Egyptians, the gently obelisks’ sloping sides and gold-plated crowning pyramids probably symbolized the paths of sun rays streaming toward earth, representing the connections between the sun god and the temple. To reflect the eternal nature of those connections, Egyptians carved their obelisks from a single piece of granite, weighing hundreds of tons. 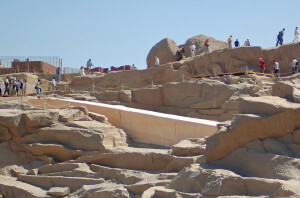 The most suitable quarry was along the Nile River in Aswan, where granite outcroppings called a “cataract” obstruct the flow of the river and once formed the southern boundary of Egypt. It is still not entirely clear how the obelisks were removed from the quarry, transported down river and erected at the temple entrances. Aswan visitors can still see the famous “unfinished obelisk,” abandoned thousands of years ago when a crack was discovered in the granite, making it useless for its intended purpose. Aswan visitors can also ride a felucca to the temple of Isis, totally bereft of the obelisks that once marked its entrance. When Romans conquered Egypt in the first century B.C., they were so enamored of the obelisks that they pulled them down from the temples and sent them to Rome on specially designed ships. Today, there are more Egyptian obelisks in Rome than in Egypt. One is now in front of St. Peter’s Basilica, a cross now extending from its apex. The largest one, also with a cross on top, is in front of St. John Lateran’s Basilica, the seat of the Pope. The obelisk now in the Place de la Concorde, the largest public square in Paris, came from the Luxor temple, which some people have said now looks like an elephant missing a tusk. Many of today’s churches, mosques and Hindu temples have tall, slender structures near their entrances, often topped with pyramids, pointing toward the heavens. Some, like the magnificent riverside Coptic Christian cathedral in Aswan, the birthplace of obelisks, feature a matched pair. These steeples, minarets and towers continue to reflect the Egyptian idea of an eternal connection with the divine.